If you enjoy watching videos of sleepers on Youtube than you’ve probably seen Leon Reitman’s 1993 Eagle Summit a few times. Leon has owned this wild wagon for many years and there are plenty of videos of it boxing above its weight. 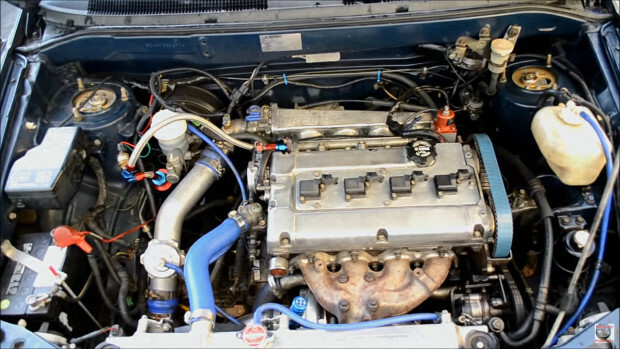 When he originally purchased the Summit it came with a NA 2.4 L inline-four and he only upgraded the suspension. But after the clutch blew he decided it was time for an engine swap. Out went the 2.4 L and in went a 2.0 L 4G63 with forged pistons, rods, rebuilt heads with HKS 272 cams all being run off a 2D DSM ECU and ECMLink V3. Couple that with a Forced Performance RED turbo at 23 psi of boost and 93 octane and the engine produces 420 horsepower. Leon further improved performance by dropping from 3,100 lbs to 2,800 lbs by removing the front bumper, AC system, EVAP system, and going to a lighter battery. That kind of power mixed with AWD has resulted in some really enjoyable videos as seen below. The best quarter-mile time (I could find) was 11.65 seconds at 121 mph.